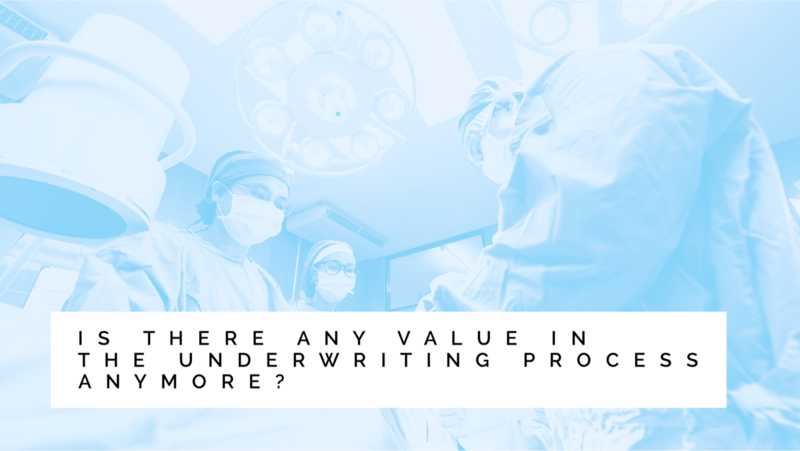 Is there any value in the underwriting process anymore? Steven Rhodes, the barrister, and recent Mastermind finalist, poses some very germane questions not only about our ability to continue to underwrite as we have done in the past but whether there is real value in the underwriting process at all. We would be interested in your reaction to this controversial and very important issue. Are you a Life & Health underwriter? What do you tell people at parties when they ask you ‘What do you do?” If you don’t have a clear story about what underwriting is for, I suggest that you start imagining one. This is because, Brexit or no Brexit, the trend is towards asking searching questions about L&H underwriting and why it needs to ask all those embarrassing questions. The L&H sector is a very insular business. Insurers from other classes rarely stick their heads around the corner to look at Life & Health. There have been cross-overs, most notably in motor business, but for the most part underwriting has had to adapt more to distribution methods (the writing of rules for PCWs for instance) than to ask fundamental questions of why things are done this way. This is changing, but it will have to change more radically, and quicker. Underwriting is now done for two reasons that, although they are sides of the same coin, look very different from outside. The first is defensive underwriting, this is the standard anti-selection process declared by every protection insurer. But increasingly there is also ‘opportunity underwriting’; the type practised by Vitality and others driven by the plan to capture a market formed of better, and higher net worth, risks. Well, you might say, it’s a free market and individual insurers and reinsurers will have a variety of approaches. We assume this market works for the benefit of society, and protection products usually attract a favourable tax regime as a result. But will this continue? It seems almost certain that the UK will implement that authorisation but there is a policy drift here. Underwriting, as we practice it, seems unfair to many people outside of the protection sector. Do insurers, as an industry, have a clear narrative as to why it works in the best interests of all consumers? Or is this just about an industry creaming off the best? Historically the industry has justified underwriting to protect against anti-selection. Underwriters are there to prevent individual companies from going bust if too much anti-selection takes place and those insurers ends up with a bucket of rubbish risks. But there are two problems with this. First is that we have a completely different industry from the one we had in Victorian times when the practice of underwriting started. Insurers these days have substantial capital adequacy margins and a host of prudential and conduct regulations to stop them going down, even against high stress-tests. There is also an NHS to keep people alive and mitigate the costs of health treatment. Second, it’s not even clear that anti-selection is the significant problem we imagine it to be. Prof Angus MacDonald at Heriot Watt University has produced a number of papers on anti-selection (adverse-selection as he properly calls it). Including one on a population anti-selecting on the basis of their finding themselves with BRCA1 and BRCA2 mutations It suggests that, even on worse case scenarios of anti-selection, premiums would rise only by high single figures. As we don’t yet know how much business is lost due to underwriting requirements (through interrupted, non-closed, sales or through people’s simple unwillingness to fill in an intrusive questionnaire) it’s difficult for the industry to say with certainty that underwriting is needed; at best it can be said that it’s always been done. As the increase in non-underwritten over 50s policies has shown, a lot of people hate filling in medical details, and as the age limit of these products creeps down to over-45s, and counting, it’s by no means clear that the loss of underwriting would mean the end of the protection industry. Meanwhile, in another part of the sector, the buzzword is Big Data. Opportunity underwriting is being used to identify not only the healthier risks, and reward them accordingly, but also the higher net-worths who will form a good basis for the sales of other products within the group. This is a trend set to continue – but the incoming EU General Data Protection Regulation is quite clear: if we ask for this information from customers we will have to make it absolutely clear why we are asking for it and what it’s going to be used for. (Theresa May has confirmed that GDPR will come into effect in the UK and the GDPR will almost certainly form part of the UK’s application for equivalency after Brexit). With Big-Data will come Big Responsibilities. So underwriters had better prepare themselves for the question “What’s the difference between underwriting and marketing?” Insurers have always maintained that they ask these, very personal, questions because they need them to operate at all. How should underwriters shape this story? If you’re an underwriter, how are you going to explain what you do at parties?